Bladder artifact during bone single-photon emission computed tomography (SPECT) is a common source of error. The extent and severity of bladder artifacts have been described for filtered back projection (FBP) reconstruction. Ordered subset expectation maximization (OSEM) may help to address this problem of bladder artifacts, which render up to 20% of the SPECT images unreadable. The objective of this study was to evaluate the relationship of the bladder to acetabulum ratio in guiding the choice of the number of iterations and subsets used for OSEM reconstruction, for reducing bladder artifacts found on FBP reconstruction. One hundred five patients with various indications for bone scans were selected and planar and SPECT images were acquired. The SPECT images were reconstructed with both FBP and OSEM using four different combinations of iterations and subsets. The images were given to three experienced nuclear physicians who were blinded to the diagnosis and type of reconstruction used. They then labeled images from the best to the worst after which the data were analyzed. The bladder to acetabulum ratio for each image was determined which was then correlated with the different iterations and subsets used. The study demonstrated that reconstruction using OSEM led to better lesion detectability compared to FBP in 87.62% of cases. It further demonstrated that the iterations and subsets used for reconstruction of an image correlate with the bladder to acetabulum ratio. Four iterations and 8 subsets yielded the best results in 48.5% of the images, whilst 2 iterations and 8 subsets yielded the best results in 33.8%. The number of reconstructed images which yielded the best results with 2 iterations and 8 subsets was the same as or more than those with 4 iterations and 8 subsets when the bladder/acetabulum ratio (A/B) was between 0.2 and 0.39. A ratio below 0.2 or above 0.39 supports the usage of 4 iterations and 8 subsets over 2 iterations and 8 subsets. We conclude that bladder to acetabulum ratio can be used to select the optimum number of iterations and subsets for reconstruction of bone SPECT for accurate characterization of lesions. This study also confirms that reconstruction with OSEM (vs. FBP) leads to better lesion detectability and characterization. The objective of this study was to determine the role of routine whole volume reconstructed single-photon emission tomography (rSPECT) compared to cine raw data to detect extracardiac uptake of Sestamibi (MIBI). In a retrospective study, the myocardial perfusion studies of 426 patients were inspected separately for extracardiac uptake on cine raw data and rSPECT. The acquisition parameters for all the images were done according to departmental protocol. The whole volume SPECT data was selected and processed by HOSEM iterative reconstruction using the HERMES computer software system. The images were assessed by two observers, a student in training and a senior consultant nuclear medicine physician. The overall mean age and standard deviation of the 426 patients at the time of the study was 60 ΁ 12 years. Statistical analysis was performed using the Kappa and McNemars tests. The clinical significance of the extracardiac uptake was evaluated using hospital folders and /or laboratory results after viewing images. rSPECT detected 25 patients (5.9%) and cine raw data identified 18 patients (4.2%) with extracardiac uptake. All the areas of extracardiac uptake noted on cine raw data were seen on the rSPECT images. Only 21 of the 25 patients had complete 5-year clinical follow-up. The value of the clinical significance of the extracardiac uptake was limited due to the study being retrospective. The proportion of positives identified by rSPECT was significantly larger than those identified by cine raw data (P = 0.0082). Although our study demonstrates that rSPECT is more sensitive than cine raw data in detecting extracardiac uptake, it also shows that there is no benefit in routine whole volume rSPECT in daily clinical practice. Impending spinal cord compression and vertebral fractures are considered contraindications for radionuclide bone pain palliation therapy. However, most of the patients with widespread bone metastases already have weakened vertebral segments that may be broken. Therefore, local field external-beam radiotherapy or percutaneous vertebroplasty (VP) should be considered to improve the patient's quality of life and to institute subsequent appropriate treatment, including radionuclide therapy for bone pain palliation. The objective of this study was to develop a strategy for an effective treatment of bone metastases in patients with widespread bone metastases and intolerable pain, associated with impending cord compression or vertebral fractures. Eleven patients (5 females and 6 males, aged 32-62 years; mean age 53.8 ± 2.7 years) with multiple skeletal metastases from carcinomas of prostate (n = 3), breast (n = 3) and lung (n = 5) were studied. Their mean pain score measured on a visual analogue scale of 10 was found to be 8.64 ± 0.15 (range 8-9) and the mean number of levels with impending cord compression or vertebral fracture was 2.64 ± 0.34 (range 1-4). All patients underwent vertebroplasty and after 3-7 days received Sm-153 ethylene diamine tetra methylene phosphonic acid (EDTMP) therapy. Sm-153 EDTMP was administered according to the recommended standard bone palliation dose of 37 MBq/kg body weight. Whole body (WB) bone scan, computed tomography and magnetic resonance imaging (MRI) were performed before and after treatment in all patients. Pain relief due to stabilization of vertebrae after VP occurred within the first 12 hours (mean 4.8 ± 1.2 hours; range 0.5-12 hours), and the mean pain score was reduced to 4.36 ± 0.39 (range 2-6). Subsequent to Sm-153 EDTMP treatment, further pain relief occurred after 3.91 ± 0.39 days (range 2-6 days) and the pain score decreased to 0.55 ± 0.21 (range 0-2). The responses to treatment were found to be statistically significant (P < 0.0001). 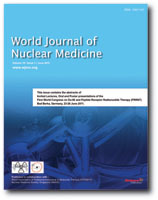 Based on the results on this limited patient population, we conclude that spinal stabilization using VP in patients with widespread bone metastases and impending cord compression is an effective way to decrease disability with pain and to facilitate subsequent systemic palliation of painful skeletal metastases by Sm-153 EDTMP therapy. 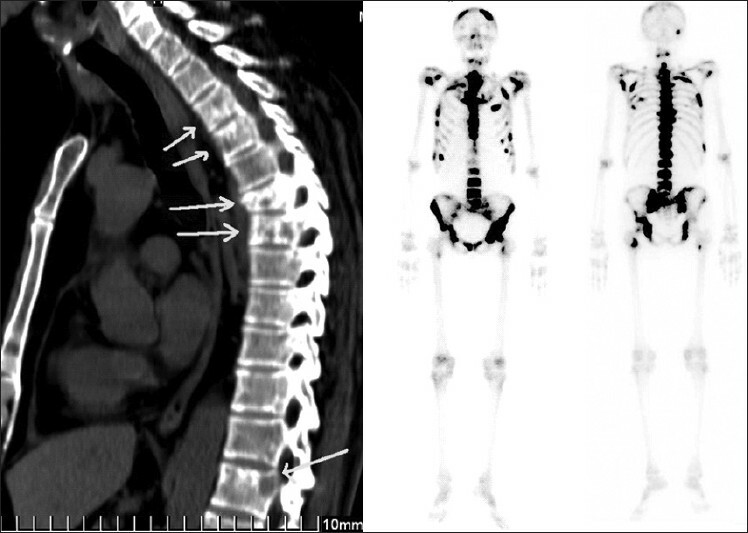 A 52-year-old male was subjected to an F-18 fluorodeoxyglucose positron emission tomography/computed tomography (FDG PET/CT) study for the evaluation of newly diagnosed non-Hodgkin's lymphoma. 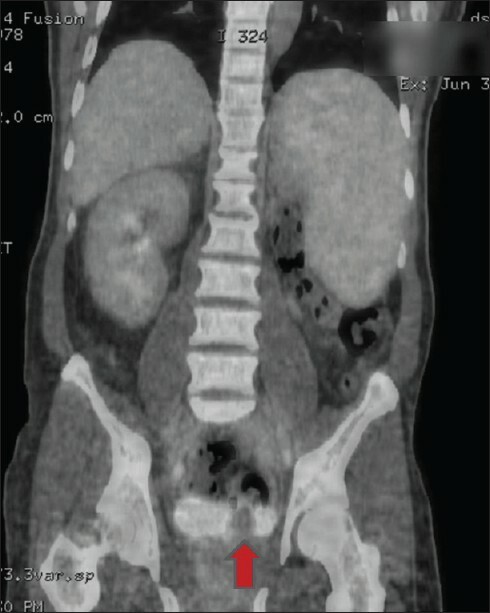 An incidental non-FDG avid urinary bladder mass was detected, as well as an absent kidney. Ureterocele was suspected, but subsequently a seminal vesicle cyst was confirmed on a CT urogram. We present a case of carcinoma cervix found to have a soft tissue lesion in retroperitoneal region with intense FDG uptake. However, this FDG uptake was false positive as the final diagnosis was retroperitoneal fibrosis.